It's hard to believe that Michigan space rockers Auburn Lull have been at it for over 11 years at this point. I suppose that their long period of inactivity during the first part of this century helps contribute to that feeling of temporal fugue, but still there is a certain feel to this record which will strike listeners as either (a)timeless or (b)stuck in the late 1990s. It seems as if there were a lot of bands making this kind of music in 1997, when Auburn Lull started out. Heck, Mogwai were just hitting their stride then, and there seemed to be a general vibe of spaced-out rock goodness floating around. Everything seemed possible, and making music that reflected dreams of beauty and tranquility seemed like a sensible thing to do. All you needed in life were a dozen or so effect pedals (and the patience to experiment with them), and you could make something interesting, something experimental, something to lead music, and humanity, forward. Of course, the world has since gone to hell in a handbasket, but this leads me to believe that we need Auburn Lull and their ilk even more than before. In a time when as simple of an act as watching the morning news can lead to heart palpitations and a general fearful malaise, music that is calming, reflective, and simply lovely has a place. It is much needed in fact. 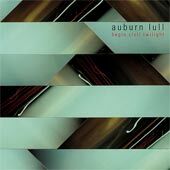 This is Auburn Lull's third release since 2004. Actually, the bulk of their work has taken place since 2004, and they really seem to have hit their groove. Begin Civil Twilight is an album of cascading layers of guitars backed by light percussion (a lot of brushed drums and lightly clanking cymbals), and breathy, hushed vocals. I know that some people will find this boring. The songs move at a pace that is often achingly slow, and there are long stretches of time, several minutes at a stretch in quite a few of the songs, where there is no percussion and only the gentle ebbing and flowing of the various guitar textures exists to demark the passage of time. I have made abundantly clear on EvilSponge my fondness for this type of ambient music, and i find that Begin Civil Twilight is a very fine example of the genre. No, really, this is stunning. I know that i have gushed about Auburn Lull's two previous full-length records on the Sponge, but this one is even more brilliant, if not equally so. Auburn Lull may only release an album every few years, but they spend the intervening time perfecting what they do, so that when an album does come out, it is of the highest quality. There are no bad tunes here. None. Patience pays off for Auburn Lull, both in waiting for releases, and in listening. The droning guitar layers unfold slowly, so slowly that there is much to listen to, too much for one listen. You have to hear the album over and over again to really grasp what is going on. The fact that the music is so light and enjoyable makes that an easy task, and very rewarding. I am particularly fond of Grange Arcade, a tune that starts with one guitar lightly strummed while the others cascade in layers around tapped drums. Eventually Sean Heenan's voice comes in, backwards echoed for an extra eerie effect, as the whole song swells and then descends. The sound gets loud and full, then quiets down to a bare layer of guitar echo, then builds back up again. Lovely. Another tune of interest is Coasts, in which Auburn Lull supplement their sound with some help from Ulrich Schnauss. Geez, it seems as if Ulrich is everywhere these days, and here he adds some keyboardy noodling to their sound. Schnauss's work always seems very propulsive to me. That is, his playing just carries a sense of movement, his tinkling keyboard sounds drive whatever they accompany forward. In general, movement is not portrayed by Auburn Lull, but with the bare hint of Ulrich Schnauss in this song, it seems to portray a journey. Fascinating, and a nice addition to their sound. One of the things i like about Auburn Lull is that, even though they have a very distinctive sound, they are always playing with the variations of what they do. For example, over half of the tracks on this album involve an additional female voice in hushed harmony with Keenan. This adds a nice depth to the vocals, and is particularly noteworthy on Broken Heroes, where Sean Heenan is joined by Elsa Heenan. The two Heenans harmonize well, her with a higher pitched voice, and Sean singing near the lower end of his range, creating a dual-layered contrasting vocal line. Nicely done. I never would have thought that i would be singing along to an Auburn Lull tune (they just aren't that kind of band), but the repeated chorus of "Oh-oh, broken heroes" just begs to be sung along with in fanboyish geekitude. Also noteworthy on Begin Civil Twilight is the use of acoustic guitars. Dreampop in general relies on the use of guitar effects, which really work best with amplified guitars. Well, Auburn Lull dispel that notion. There is an acoustic sound on the previously mentioned Grange Arcade, and in fact the album's closer, the untitled hidden track 12, features prominent acoustic guitar. Actually, with the main guitar lines replaced with an acoustic, while secondary lines still tinkle with amplified echo, this sounds a lot like something that July Skies would do. That is an interesting thought -- July Skies do Auburn Lull's dreampop on an acoustic guitar. Who knew? I could go on -- and on and on -- but i will stop gushing at this point. The conclusion is this: once again Auburn Lull have crafted a fascinating, rich and complex album of mellow tones and heavy distortion. I am glad that the band is out there making this peaceful music. I need such tranquility coming from my stereo. I highly urge fans of ambient and dreampop to check out this record, or anything in the Auburn Lull catalog. Get the album, put it on, and sit back and listen. It's a very rewarding experience.